The Senior Patrol Leader is elected by the Scouts to represent them as the top junior leader in the Troop By accepting the position of Senior Patrol Leader, you agree to provide service and leadership to your troop. The responsibility should be fun and rewarding. This job description outlines some of the things you are expected to do while serving in this leadership role. Comments: The Senior Patrol Leader is the focal point of the troop. He needs to attend as close to all troop functions as possible. One of the major parts of the SPL’s job is to appoint other troop leaders. He must choose leaders who are able, not just his friends or other popular Scouts. Boy Scout troops following the patrol method are Boy-Led and the young man in charge is you! 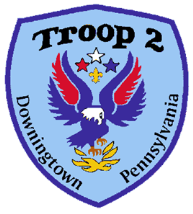 Training: You must attend Troop 2 Leader Training even if you have attended in the past. Attendance: You are expected to attend 85% of all troop meetings, Patrol Leaders’ Council meetings, outings, and service projects. If your attendance is low, or if you have three (3) unexcused absences in a row you can be removed from your position. Uniform: Set the example by wearing your uniform correctly. This means that you will wear all of the parts of the troop uniform, shirt tail tucked in, with all required badges in their correct locations. Attendance: Set the example by being an active Scout. Be on time for meetings and activities. You must call the Scoutmaster (or an Assistant Scoutmaster if the Scoutmaster cannot be reached) if you are not going to be at a meeting or if you suddenly have to miss an outing. You also need to make sure that the Assistant Senior Patrol Leader is ready to assume your responsibilities. This requires you to ‘Be Prepared,” plan ahead, and this will never be an issue. Runs all troop meetings. events, activities, and the program planning conference. Resolve conflicts between troop members. Participate in a conference with your advisor midway through your tenure to discuss and evaluate your responsibilities and the performance of your duties. Note: You can still have a conference with your advisor at any time if you feel like having a discussion–. just ask. Preside at all Troop meetings, events, and activities and the annual program planning conference. Have an agenda and backup plan for each meeting or event and share it with the ASPL one (1) week in advance of the event. Call people responsible for program items and remind them of their responsibility. Conduct the meeting or event and direct the activities of other Junior Leaders and Scouts. Notify the ASPL if you are going to be absent from a meeting or event. Runs the Patrol Leaders Council (PLC). Issue an agenda before the PLC so all can properly prepare for the meeting. Review the detailed program for the next month. Plan the following month’s program in detail. Assign responsibilities for each program item. Discuss the 2-month additional look ahead. Before making any assignments, find out which Scouts need leadership positions for advancement. Make selections based on above and Scouts experience, dependability and the requirements of the position to be held. Delegate responsibilities throughout the Junior Leaders in the troop. Call the SM, ASM, or JASM to confer on upcoming program items. Call the ASPL each week to check they are following up on their assignments and communicate program information.